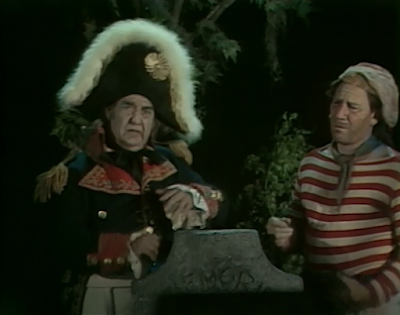 In “The Flying Dutchman, the ghostly Captain Beane (Stanley Adams) of the Flying Dutchman materializes in the local graveyard in search of new crew-members for his famous, eternal ghost ship. 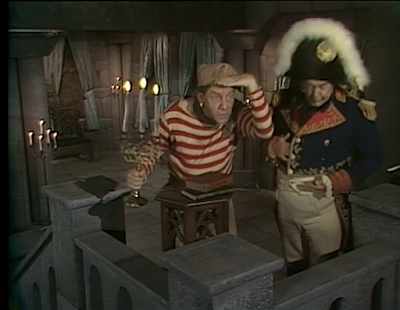 He and his first mate, Scroggs (Philip Bruns) spot Spenser (Larry Storch), Kong (Forrest Tucker) and Tracy (Bob Burns) and settle on the trio as perfect candidates. “The Flying Dutchman” is probably the weakest episode, thus far, of The Ghost Busters. At least the villains of the week are actually ghosts this time, and not the ghosts of monsters (like a werewolf, or the Frankenstein Monster). 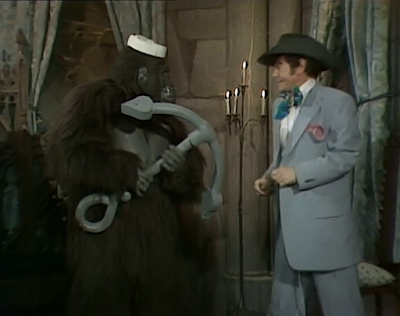 Still, that’s hardly an endorsement, as the episode features lame gags (“I haven’t had so much fun since Long John Silver taught me the one step…”) and some poor special effects. On the latter front, the interior of the castle this week apparently becomes sea bound, and sprays of water hit Captain Beane. It looks like someone is squirting him with a water pistol from right off-camera. Stanley Adams is our villain of the week, and this episode aired approximately two years before his tragic death, in 1977. Adams is beloved by a generation of TV fans for his work on Star Trek (“The Trouble with Tribbles,”), The Twilight Zone (“Mr. Garrity and the Graves”) and Lost in Space (“The Great Vegetable Rebellion”) but The Ghost Busters’ “The Flying Dutchman” doesn’t represent one of his better or more well-known roles. Nope, it's just goofy business as usual, for this live action cartoon. Castle set! Nice to see Stanley Adams.